But then... the day got shuffled again. In a hero-to-zero performance Pierre Gasly at two-third's distance drove into the back of his Toro Rosso team-mate Brendon Hartley, going for a gap that wasn't there (though in mitigation there was confusion as Hartley had just been told to let Gasly by). 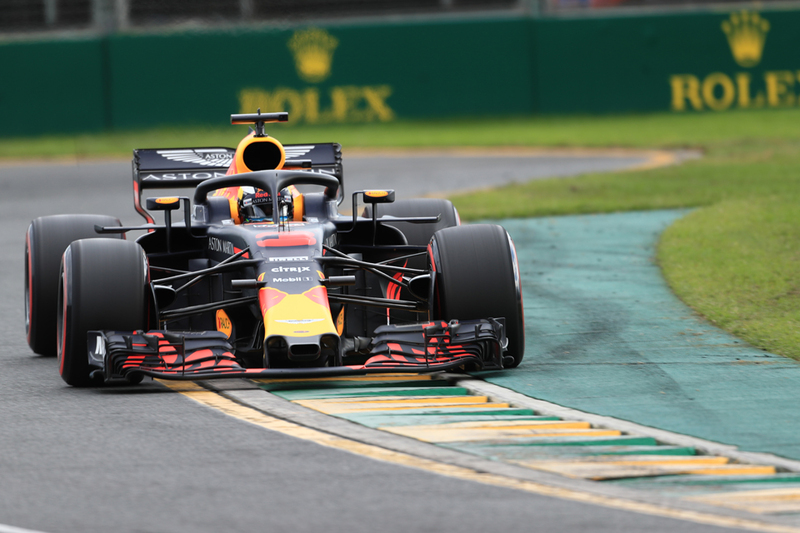 A safety car was brought out due to the resultant debris, and Red Bull within a blink brought both cars in for new boots. Mercedes and Ferrari didn't pit either car. Suddenly the race was in the palm of Red Bull's hand. Initially it looked like it would be Max Verstappen's day but not for the first time this campaign he trod on his own tail. First he ran off at the esses going for a pass of Hamilton that wasn't on, then he drove into the side for Vettel at the hairpin putting both into a spin. It got him a 10 second penalty too. This all left the ubiquitous Ricciardo in the box seat. He nipped by Max when the Dutchman had his esses detour, then got on with it. In something that at last looked typical. He picked off Hamilton with one of his moves under braking from a different postcode behind. Then he cruised past Vettel on the main straight. And his move to seize the lead from Bottas was the best of the lot. At turn 6, again under braking from a mile back, but this time through a gap the width of a cigarette paper as Murray Walker used to say. The day, wonderful day, was Ricciardo's. Bottas salvaged second, ruing the safety car. Kimi Raikkonen in the other Ferrari got third, attacking Bottas hard at the end. 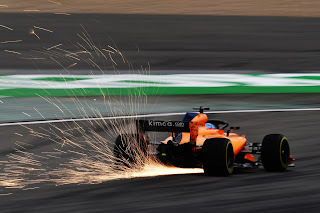 His was another race to go around the houses as for a time it appeared ruined when he was used as Seb's strategy pawn, left out on worn tyres for several laps to get in the way of Bottas. It had an unlikely flipside though of fresher tyres on which to attack after the safety car closed everyone up. As for Hamilton he had one of his chin-on-the-floor days, replete with telltale defeatist noises on his radio. Indeed they started before the race did as when on the dummy grid he doubted his ability to do a one-stopper. "I was in no man's land today, I had no pace," he mused afterwards "I was just trying to hold onto whatever I had...Yesterday and today have been a disaster on my side...Thankful for a couple of incidents ahead today that kept us kind of in the battle." Yup - as if to show the race's back to front logic from the championship angle the day was delivered into Lewis's hands. 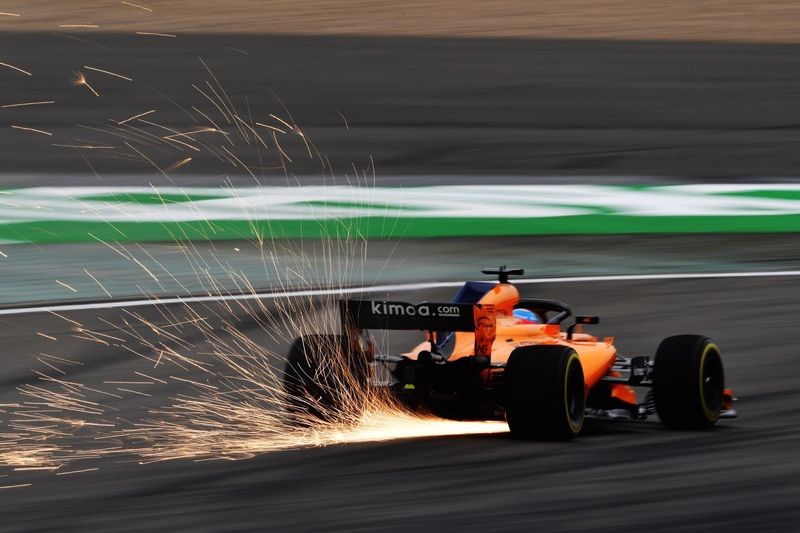 He finished fourth (promoted a place after Max - ahead on the road - had his penalty applied) while a subdued Vettel got eighth after being elbowed aside by Fernando Alonso of all people near the end, who got seventh. "I don't seem to win boring races...", said Ricciardo afterwards. Quite. It's his sixth race win and all have come from starting outside of the top four. "It was hectic, I heard Safety Car and they said we are going to double stop. "It happened very quickly, very decisive winning move from the team." On his pass on Lewis? "Sometimes you've got to lick the stamp and send it." Again, quite. "Obviously I knew I could get a little more out of the braking them him. You know you have one chance to try so I made the most of every opportunity." What about his pass on Bottas to take the lead? "It was close, I think hard but fair. "I saw him defend so I wanted to go shallower, but then he came a bit more so I thought about pulling out...nah I'm just kidding. "I always knew there was enough room and my tyres had pretty good grip so worse case I'd go wide and have another go." He really is a major asset for F1. It was worth reflecting also that 24 hours earlier it looked like Danny Ric wouldn't even make qualifying after an engine failure in morning practice. And having made it out at the last minute he only escaped Q1 by less than two tenths. Indeed despite our early race misdirection the Red Bull-type pomp was in fact provided by Red Bull. In addition to its sharp strategy and breaking all records for changing an engine in double quick time, twice today it pitted both cars on the same lap. "24 hours ago I thought we may be starting at the back of the grid," Ricciardo continued. "Thanks to the boys, today is the real reward for that. The mechanics worked their butts off." Bottas noted on the slowing down lap that "the safety car was so unlucky for us! ", summing up the day's shift. It was a theme he returned to later. "The race was going pretty well for us, we were looking strong until the safety car stop," he said. "It is disappointing. We were giving everything we had and it felt like we deserved the victory. "It felt like everything was under control. This is racing and these things happen." Underlining how F1 in 2018 is different, for the first time in the hybrid era Mercedes has now gone three races without victory. Nico Hulkenberg continued his fine Mr Consistent form this season, starting seventh again (for the sixth time in a row...) then converting it to a P6 finish. The other Renault of Carlos Sainz and then Kevin Magnussen's Haas completed the scorers in ninth and tenth respectively. We entered this Chinese Grand Prix weekend hoping for our confirmation of how this season was going to go. After it perhaps the best steer is to expect the unexpected.